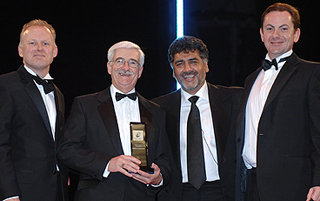 Haldex Concentric, the Birmingham-based manufacturer of diesel engine pumps, has won the Sustainability category in the annual award scheme held by Midlands Excellence, the regional organization that promotes business excellence and audits EFQM in the UK. The judges commented on the fact that sustainability is embedded throughout the company from product design to manufacture and that there was good visual management of all operational phases. Haldex Concentric has instituted a comprehensive set of initiatives to ensure that everyone in the organisation is aware of both direct and indirect environmental impacts, creating high efficiency in line with a comprehensive road map for sustainability. Exceptional levels of material recycling have been achieved and there is an ongoing drive to require the ISO 14001 environmental standard throughout the company's supplier base. Haldex Concentric manufactures around three million oil, water and fuel pumps for commercial diesel engines, supplied globally to major engine manufacturers from four Concentric facilities in Birmingham UK, Chicago USA, Pune India and Shuzhou China. The company's R&D programme has led to some innovative new products that significantly improve vehicle fuel economy and deliver major reductions in C02 emissions, benefiting both the UK and global environment. One of the highlights is a coolant pump capable of achieving 74% peak efficiency compared to a previous maximum of 60%, a performance that can be considered 'world class'. This efficiency can improve C02 emissions by at least 0.2% which, in a typical application, would equate to a net annual reduction in C02 of 75.6kg. per vehicle or a global saving of 75,600 tonnes p.a. over the one million pumps of this type supplied by Haldex Concentric in the course of a year. Haldex Concentric has also developed an oil pump in which output is controlled to match the varying levels of lubrication required throughout the engine's cycle Typically, this gives a 1 % reduction in C02 emissions and a corresponding improvement in fuel economy. Based on annual mileage of 90,000 km, this 1% reduction equates to an annual saving of 362.9kg C02 per vehicle. So, one million Concentric pumps offer the potential to reduce global C02 emissions by 0.36million tonnes annually. Other significant developments from Haldex Concentric include a controllable water pump that will provide further emission and fuel benefits in diesel engines. In addition to considering product function, Haldex Concentric has taken a holistic approach to environmental impacts such as material recyclability, weight and size optimisation as well as cost, which will ultimately be a deciding factor in product uptake. Consideration is also given to packaging materials, manufacturing processes and the environmental credentials of potential component suppliers. David Woolley, Managing Director of the Haldex Concentric plants in Birmingham and India Commented; "We are extremely proud to have won this award against some very strong competition. It reflects the hard work of the complete team. In addition to the advances we have made in clean technology, equal effort has been invested in lean, green manufacturing. There has been a fundamental change in our approach to waste management and the company's overall carbon footprint. Waste has been reduced by 80%, the company only purchases "green" electricity, waste water is filtered, waste streams are separated to minimize landfill and maximize recycling, oil is filtered and recycled, while solvents have been virtually eliminated." Concentric Pumps Ltd. was acquired by Haldex AB in February 2008 and is now known as the Engine Business Unit of the group's Hydraulics Division. The unit is a major supplier to the world's truck, agricultural and construction equipment industries, with manufacturing facilities in Germany, Sweden, the USA, China and India as well as at the divisional headquarters in Birmingham, UK. In addition to oil, fuel and water pumps for diesel engines, Haldex Concentric manufactures the Alfdex air/oil separator, Varivent EGR accelerator, integrated front cover assemblies and lubrication pumps for transmissions and reciprocating compressors.